Did you know that January is National Puzzle Month—or that January 29 is National Puzzle Day? If not, don’t feel bad: neither did we. But one thing we’re quite sure of is that doing puzzles is a wonderful way to spend time with your family. Plus, it’s good for you. Whether it’s a 1,000-piece jigsaw, a crossword, a sudoku, or something else, doing puzzles has been shown to increase alertness and concentration, improve memory and mood, boost problem-solving abilities and spatial reasoning, and lower stress levels. So in honor of National Puzzle Month, here are a few puzzle-icious ways to disconnect from our hyper-digital lifestyle, reconnect with your family, and generally improve your life. 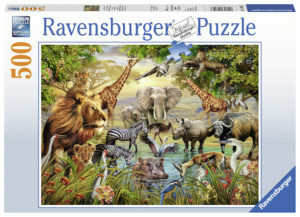 This entry was posted in Reviews and tagged benefits, puzzle, ravensburger, tcg on January 18, 2019 by Parents@Play Team.